Mindfulness has received a lot of attention recently as an approach to improving mental health in a number of conditions. But is it really effective as part of a strategy for treating serious depression? And, if so, how can we best incorporate it into treatment, given the great difficulty that many people with depression have doing even a small amount of mindfulness practice? A study and accompanying editorial in the April 2016 edition of JAMA Psychiatry, probably the most prestigious journal in the field, summarizes the state of the research on this topic, at least in terms of the most common approach to incorporating mindfulness practice into the treatment of depression: Mindfulness Based Cognitive Therapy (MBCT). They found that MBCT was not only effective, but that it performed well when compared with other active treatments, including antidepressants. There was an intriguing suggestion that emerged that MBCT might actually be more effective the more severe the initial severity of depression. This would contrast with other psychosocial therapies which tend to be less effective in more severe forms of depression. Our conclusion is that MBCT is an important addition to our arsenal of treatments for severe and recurrent depression. It may be especially useful as a treatment that begins after active treatment with a medication has reduced the severity of depression somewhat, and it may be among the most effective treatments for preventing future episodes of depression. Still unclear is how often it will allow patients to taper off of medications or whether it will most often be combined with medications. It joins other newer treatments for severe and recurrent depression, including transcranial magnetic stimulation (TMS) and ketamine. Dimidjian S, Segal ZV. 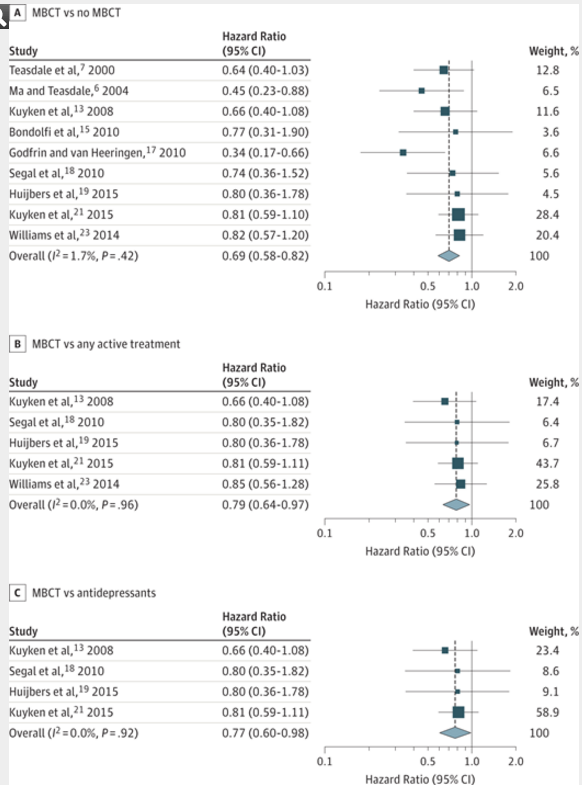 Prospects for a clinical science of mindfulness-based intervention. Am Psychol. 2015;70(7):593-620. Davidson RJ. Mindfulness-Based Cognitive Therapy and the Prevention of Depressive Relapse: Measures, Mechanisms, and Mediators. JAMA Psychiatry. Published online April 27, 2016. doi:10.1001/jamapsychiatry.2016.0135. Kuyken W, Warren FC, Taylor RS, et al. Efficacy of Mindfulness-Based Cognitive Therapy in Prevention of Depressive Relapse: An Individual Patient Data Meta-analysis From Randomized Trials. JAMA Psychiatry. Published online April 27, 2016. doi:10.1001/jamapsychiatry.2016.0076.